A 9/11 Truth “Salon des Refusés” ? The full DVD covering all 3 towers will be available soon. 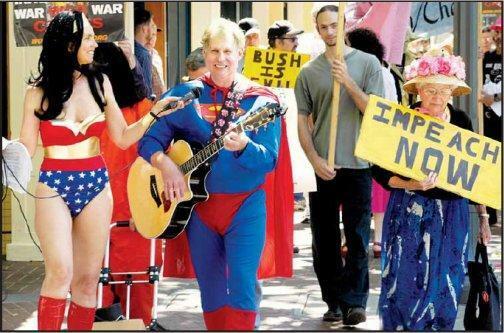 Heroes and Superheroes gather, sing, rally, march for Truth, Peace, Impeachment in Palo Alto. Master of Ceremonies, KPFA's Dennis Bernstein will pass out awards to Citizen heroes for 9/11 Truth- including Dr. Robert Bowman, Richard Gage, AIA, Janette MacKinlay, and Cosmos. Winnipeg 9/11 Truth packs 3 events in 2 days! All three advertised public 9/11 Truth events in Winnipeg were filled to capacity on May 29 & 30. Richard Gage, AIA, Architect, took a crowd of over 200 through a Power Point presentation of solid evidence that the collapses of WTC 1, 2 & 7 could only have been the result of controlled demolition. Media critic, author, and documentary producer Barrie Zwicker presented the case that the media have been negligent in reporting about the 9/11 Truth movement. Questions from the audience found answers from both speakers. Even campus police were in attendance, listening. Next we rushed back downtown to the historic Hotel Fort Garry, where Mr. Gage would present again to an audience of 300 at the magnificent Provencher Ballroom. The audience included several architect and a smattering of engineers, as well as some police, firefighters, and various professionals. At the end of Mr. Gage's presentation he polled the audience to see who now believed in the controlled demolition theory; nearly everyone raised a hand. Upon all chairs at this and each event we laid manila envelopes containing a copy of the 9/11 Mysteries DVD plus the "11 Remarkable Facts About 9/11" flashcard, and a collection of print articles, including (former) Winnipeg Sun editor John Gleeson's well-known recent column, "Scholars debate 9/11 findings." The Hotel Fort Garry Audience also received a data CD containing the recently released WTC blueprints. We have sustain trouble from spammers on AE911Truth.org posing as Architects or Engineers, and I regret that I was out of town on a whirlwind speaking tour in Winnipeg and therefore couldn't have fixed the problem before imposters were posted on our site. Of course we should have verified these names prior to displaying them and we take responsibility for this oversight in the rush to get our website www.ae911truth.org published. We will now be verifying the credentials of all architectural and engineering professionals who request to join us in calling upon Congress for a new investigation prior to displaying them on the website. This will take us a few days since there have been over a hundred new requests for membership. Our verified count is 44 A/E's and we expect to verify another 30 at least within a few days. Thank you for the hundreds of emails supporting our effort! Winnipeg Sun: 9/11 an 'inside job'? Conspiracy buffs are in for a big treat. California architect Richard Gage will be in Winnipeg this week to offer his explanation of why the World Trade Centre towers collapsed on Sept. 11, 2001. Gage has become a leading figure of the so-called 9/11 truth movement, an informal campaign from people all over the world who challenge official accounts of what happened that day. He argues that a deliberate, controlled demolition using explosive devices is what really destroyed the twin towers that day, along with another skyscraper known as WTC 7 or Building 7. Speaking to Sun Media from his Bay Area home this weekend, Gage said few people are even aware of the third building. It was about a month ago when I saw Richard Gage's online video. After looking into his credentials, I said to myself "he's the ticket". The whole plan came to me in an instant. If we could get Richard Gage in town to speak to a group of his peers, we could then take those awoken architects and engineers to the first responders. The architects build the buildings the firefighters fight fires in...the firefighters would have a hard time arguing the simple physics with a bunch of architects and engineers. Dr Hawkins came over and wanted to do even more 9/11 activism when I showed him Mr Gage's video and I said "we need to get this guy here to speak to his peers and some firefighters"....his response was, "ok, lets do it". Neither of us like to sit back and watch the world go by, so he was on the horn right away to get Gage up to the great white north. Believing in nothing on a small scale, the plan escalated to bringing in Barrie Zwicker and inviting all the local journalists to a round table discussion on the media silence. Bam! Dr. Joe hooks up Barrie Zwicker to come in and host the discussion. Hey, since all the teachers at the university got a dvd or 2, let’s get both Zwicker and Gage to speak at the university. More phone calls and the university was booked. Richard Gage, Barrie Zwicker, and Dr. Joe Hawkins are going to rock Winnipeg, Manitoba, Canada next week. What: An afternoon colloquium on recent historical public perception management, information control, and propaganda surrounding the events of September 11, 2001. The two sessions will focus on media coverage and misinformation around 9/11 issues with examples of case studies concerning the destruction of the WTC towers and Building 7. Details: Saturday, April 21, 2007, 1:00 pm to 5:00 pm at Berkeley City College 2050 Center St. (one block west of the Downtown Berkeley BART in the basement auditorium). This event is free and open to the public and is wheelchair accessible. Session One - History and Context- A conversation between BCC history instructor Mickey S. Huff, MA, and KPFA's Guns and Butter host Bonnie Faulkner on the weaponization of information in U.S. history and media misinformation and alternative coverage on 9/11 issues. Media research group Project Censored hosts a "no-holds-barred" second look at the world's three largest structural failures in history as San Francisco architect Richard Gage presents the results of his extensive research into the collapse of World Trade Center buildings 1, 2 and 7 on September 11, 2001. A one-hour multimedia presentation is set for 7 p.m. on Friday, April 20 in Darwin 103. General admission is $10, students, $5. Gage, founder of the organization "Architects & Engineers for 9/11 Truth," examines how World Trade Center 7, a 47-story high rise building, fell straight into its own foot print in 6.5 seconds, and why tons of molten metal were later found under the rubble. The presentation includes a scrutiny of governmental building failure reports and "the holes they leave regarding the possible use of explosives on 9-11." The accounts and conclusions of firemen, physicists and other experts are addressed and questions about the damage by jet impacts and fires on the World Trade Center twin towers are answered.